Shin Megami Tensei: Strange Journey Redux goes beyond the usual class, teen, civilian, or Japan-inspired settings and takes players into the world of a military task force sent in by the United Nations to investigate and protect Earth. A gigantic black hole-esque void has appeared in Antarctica that’s continuously growing and swallowing the planet little by little. Any efforts made to send drones in for reconnaissance proved to be unfruitful as they were all ultimately destroyed upon entering the unique atmosphere of the void known as the Schwarzwelt, so humans are sent in with next-generation, state of the art gear and technology, known as Demonica. The mission quickly turns dire as all ships containing their units crash land with little to no resources to be able to get back out other than an almost human-like AI called Arthur who helps oversee everything, analyze data, and make sure that studies are conducted on the Schwarzwelt in an eerie, HAL-inspired way. 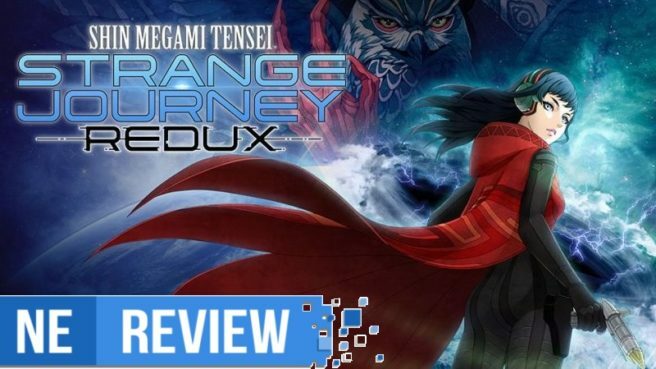 The game begins with a wonderful opening animation that we should all be used to by now that shows just how great the artists in the series really are, helping to bring Strange Journey Redux to life even more with its updated visuals and vast improvements over its DS counterpart. Players will be guiding a protagonist in which they’ll be responsible for naming and growing. As it becomes increasingly apparent, humans themselves will have a tough time surviving a world of torment and demons. It becomes a “the enemy of my enemy is my friend” situation as your Demonica suits are mysteriously upgraded with new firmware that allows you to befriend, summon, and fuse demons to help you complete your mission. The menus within your Demonica that you’ll be managing frequently for your Demons, Items, Apps, and more are a little messy at first, and while they don’t necessarily get better, things tend to get more organized as you go further into the game and you inevitably will get used to it. But when trying to find something simple like checking more information on tutorials (characters will only explain so much – if nothing at all – before they send you a “Document” for you to read on your own accord) or background on various equipment and mechanics, it can get tedious as you’re wondering where exactly it’s placed and, even more importantly, why some menus are located where they are. 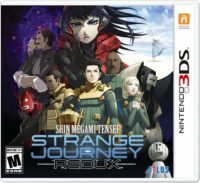 All things considered, however, the menus are simplistic and get the job done – it’s just rather akin to searching through multiple folders that may or may not be labeled correctly on your computer and finding that most of them only have one file within each, so it’s really just trial and error. 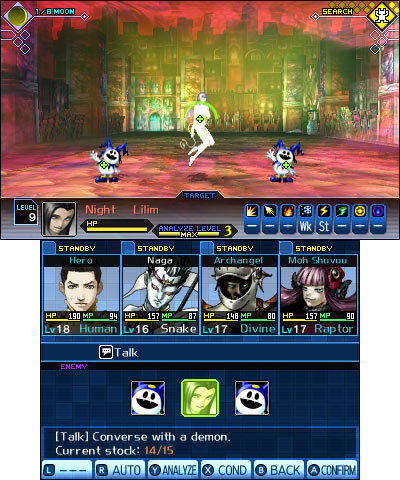 Demon taming is still very much how it’s always been in Shin Megami Tensei titles, though. You won’t be catching demons or weakening them in a traditional fashion, but instead persuading them to join your team. Most of the time this will come with a catch, like answering and asking the right questions, and maybe a little bit of a bribe where some demons will ask for some of your HP or MP, the currency Macca, or sometimes even going into your inventory. You can refuse any of these requests whenever you’d like, but depending on the demon, it could go either way. There are moon phases as well to keep note of – eight in total – and while I never found it too important to worry about or even pay attention to, typically on a full moon you’ll have a very low chance of recruiting a demon, with most of them either being too hyper and excited to bother with talking since they’re out for blood, or just simply disgusted with the fact that a human would even think about trying to engage in conversation. Sometimes they’ll get so repulsed they will actually just walk out of the battlefield which will end the fight and not reward you with any experience points or drops. 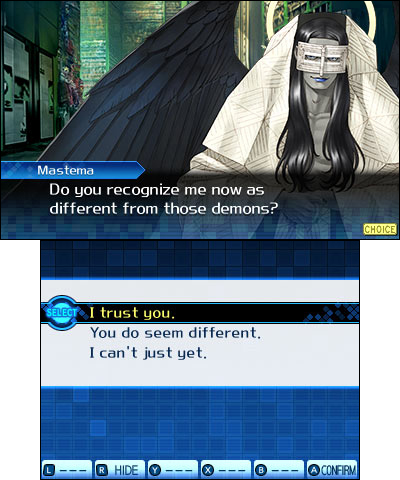 I’ve always found this to be amusing in Shin Megami Tensei titles, especially with so many different dialogue choices and personalities from the plethora of demons in the series that whether you’re successful or not it makes for an entertaining interaction. Simply recruiting a team of demons won’t help you out in the long run, however. Players will need to be able to fuse just about anyone and anything to build and grow them into much larger and more menacing demons as your own character grows with them. There is a limit to fusions, though, that is capped by your own level. If your protagonist is level 20, let’s say, then you can fuse and recruit demons up to that level as well. Attempting to fuse demons above your level cap will just deny you, and even if you successfully sway a demon to join your party that’s a few levels above you, they’ll even tell you to “get stronger, then we’ll talk again”.